Big Brothers Big Sisters of Southwest Virginia, Inc.
Big Brothers Big Sisters is searching for adult mentors who can provide friendship and support to a child growing up facing adversity. All that is required is spending time with a child two times a month for a few hours. This is not about counseling, replacing a parent or being a peer. It's about showing a child that there are opportunities in the community they might not have the chance to experience, this is about low cost/ no cost activities that encouraging a child to reach his/her potential. It's about being consistent, supportive and encouraging a child to reach past what they face each day. 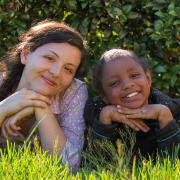 Please visit www.bigslittles.org for an application and more information. More opportunities with Big Brothers Big Sisters of Southwest Virginia, Inc.